This is the recipe for just basic M&M cookies that you can whip up super quick. 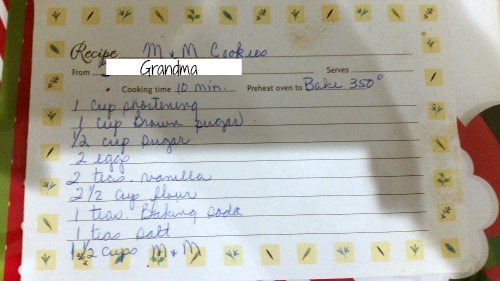 The recipe I was given literally just says 'M&M cookies' the baking time and the ingredients - no instructions. So I'll give you some! Preheat the oven to 350 F and combine the shortening, brown sugar, sugar, and vanilla extract into a mixing bowl. Beat until creamy. Add eggs and beat again. In a measuring cup measure out your flour, baking soda, and salt. Add slowly to the mixture until it's all added and mix until 'dough-like' (do not over-mix it!). Measure out your M&M's and dump them into your dough. Using a baking spatula fold the m&m's into your dough. On a greased cookie sheet place your dough in whatever size cookies you wanna make (I usually make about teaspoon sized cookies). Pop 'em in the oven for about 10 minutes, you want them to be a yummy golden color. Viola! You've got delicious M&M cookies!